Welcome to the first update of 2016. 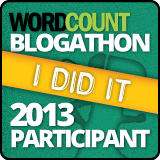 It will be a short one, but I can say that I have accomplished one goal and started on a second one already. (If you missed it, here are my 2016 goals.) 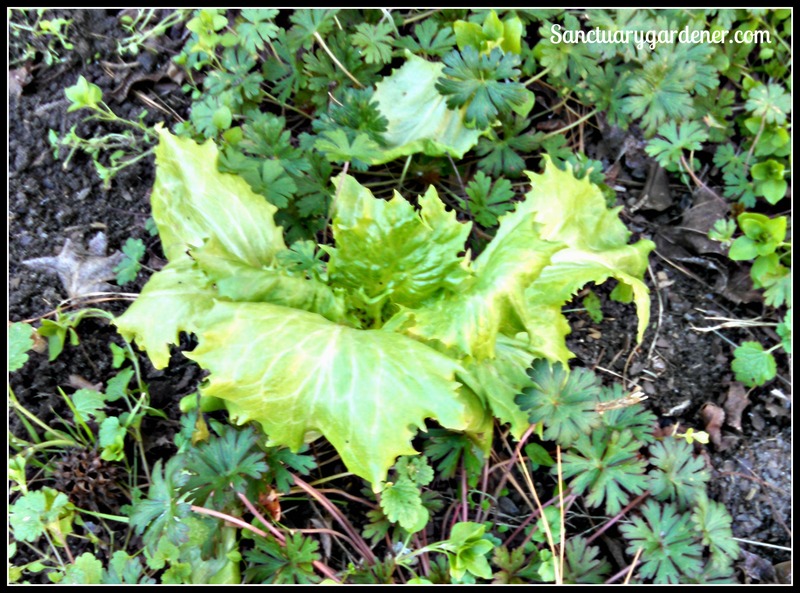 While out in the garden yesterday afternoon to gather soil samples (and do some weeding), I also took a few pictures to share with you. My main objective was to take two soil samples from each of my 21 raised beds for a soil analysis. (Click here for my process and where I sent it this time.) Although Clemson University has a great soil test, I need one with more detail – one which I can send for interpretation and suggestions for improvements. I thought I’d start some weeding while I was at it, but after three hours, I was able to clear out only 3 beds – and the areas of each bed where I was digging for a soil sample. Even at that, I filled 3 and a half lawn and leaf bags! While clearing out the first three raised beds, I got a few surprises. 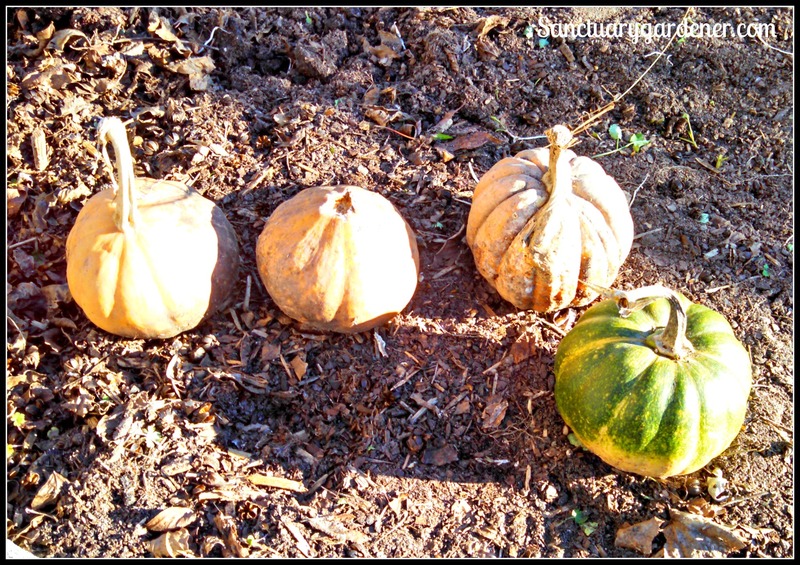 First, I found two pumpkins and two winter squash hiding under the weeds! I guess the “bedding” was enough to keep them protected from the frosts. They’re small, but I think they’re still good enough to eat. 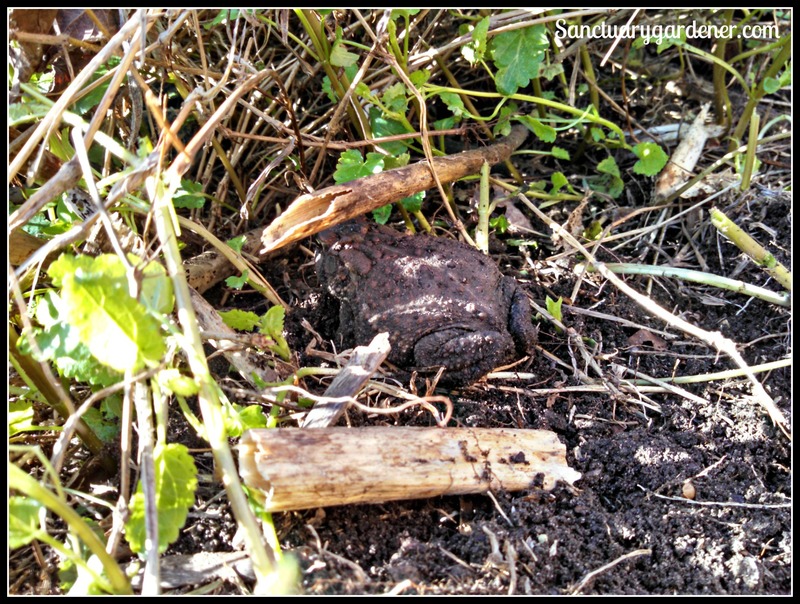 Another surprise I got while digging for soil was finding this garden toad. 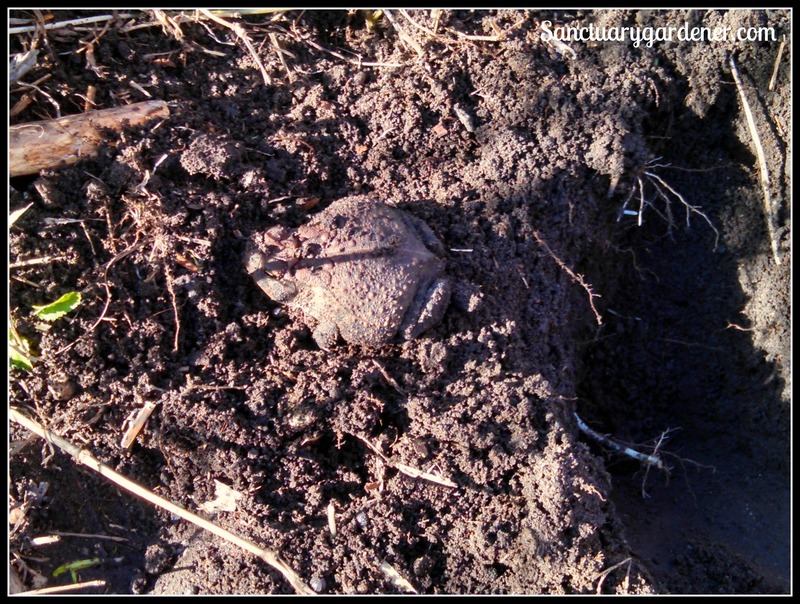 I thought I had dug up a lump of dirt…until it moved! He seemed okay as he hopped under the weeds to safety. Here’s a really interesting surprise. 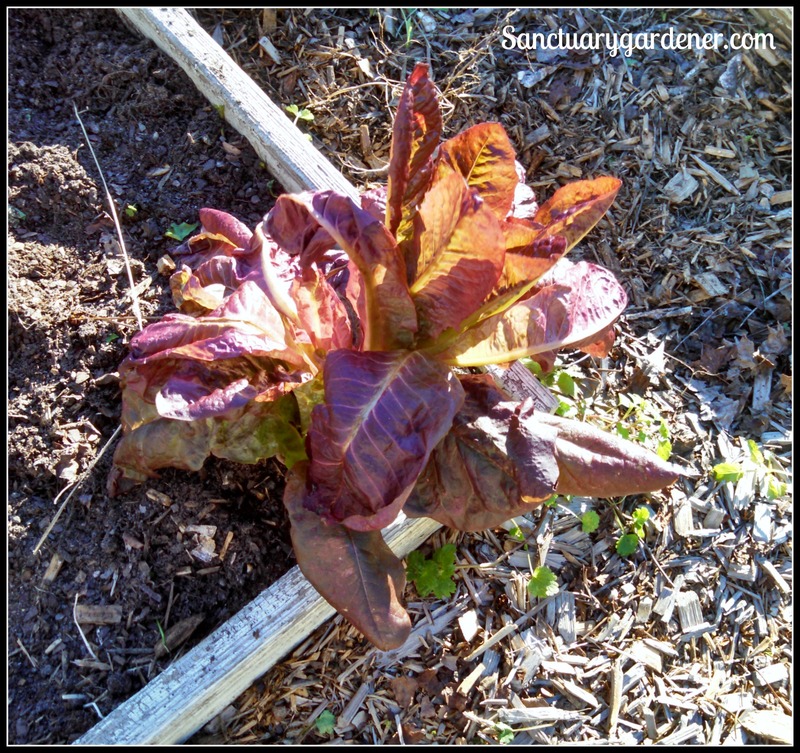 I haven’t had lettuce in my garden since last spring, but I found two “volunteer” lettuce plants in a couple of my beds. They need a bit of watering, but I might have a taste of lettuce this week. And now for the not-so-good surprise. 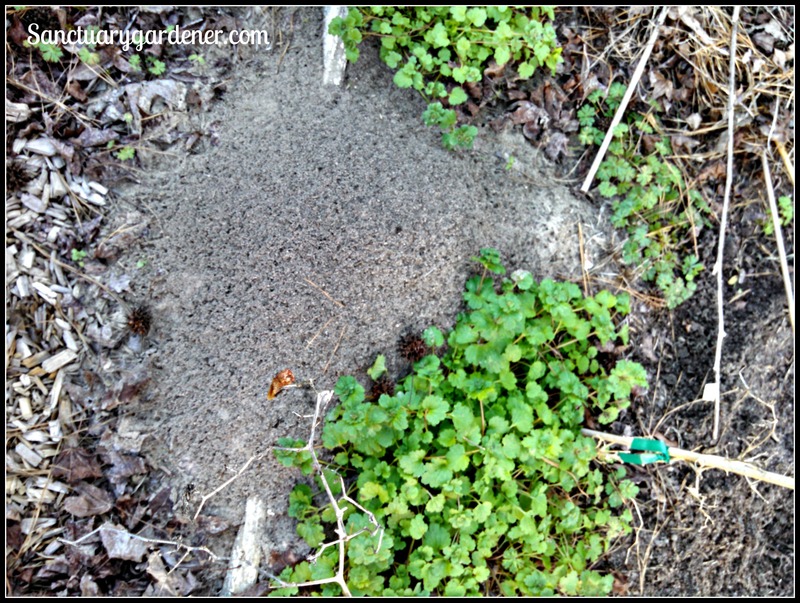 My yard has become a mine field of fire ant hills, and I found four or five of them inside my raised beds. I’m going to need to get rid of them before I amend my soil, for sure. And they’re huge! Here’s the one in the bed where I had grown my okra. I must say, I am sore from working in the garden after not having done it in a while. But it’s a good kind of sore. I’ll be back at it next weekend to clear out some more beds – and kill those fire ants. Oh, by the way, since fixing the greenhouse, it’s been holding very steady – even through the windy storm we had a few days ago. And it’s nice and toasty inside. My key lime trees are doing great. How are things in your garden/greenhouse this week? Thank you for your website, I am enjoying it very much. I found your site while researching extreme phosphorus/calcium levels in my garden soils. You can imagine my complete surprise when I saw your same (last year’s posts) and similar soil problems that I also have! and I am 1 1/2 hours just northwest of you, within the sandhills region of Lexington County. The Clemson Extension test page you posted is practically an exact replica of the test I had done last March (2015). I have not been able to resolve the problem; which could conceivably take a few years; but I have stopped using cow manure, and mushroom compost in the garden beds proper, and no more eggshells or coffee grounds in my compost. I will try the epsom salt foliar spray on my broccoli, brussel sprouts, kholrabi(seedlings) in the garden right now; I put up a 16X20 ft. hoop house over the main garden bed earlier in Dec. in an attempt to overwinter parsley, green peppers, a few houseplants, and as a place to raise late Winter/Spring seedlings. So far it is keeping plants protected, though unheated. The peppers did die back with the 20-30 degree cold we have had over the past week. I will be very interested to learn what your new soil tests results will reveal, and, importantly, what recommendations and advice you may get from the other lab. With my C.E. test, I talked extensively with an agent and I was still confused in the end as to my options of how to correct the K/Ca problem. My soil test has notes scribbled all over from the agent’s suggestions; but in review, my notes do not reflect any concrete solutions per se. What I find very telling and interesting though is that you have raised beds-so I’m assuming you purchased bags of soil, compost, etc…to fill the frames? and my garden I created straight from the backyard, so it is ‘in ground’-with soil amendments(black cow manure, mushroom compost, and other ‘organic composts’) I have added over the last 4-5 years. 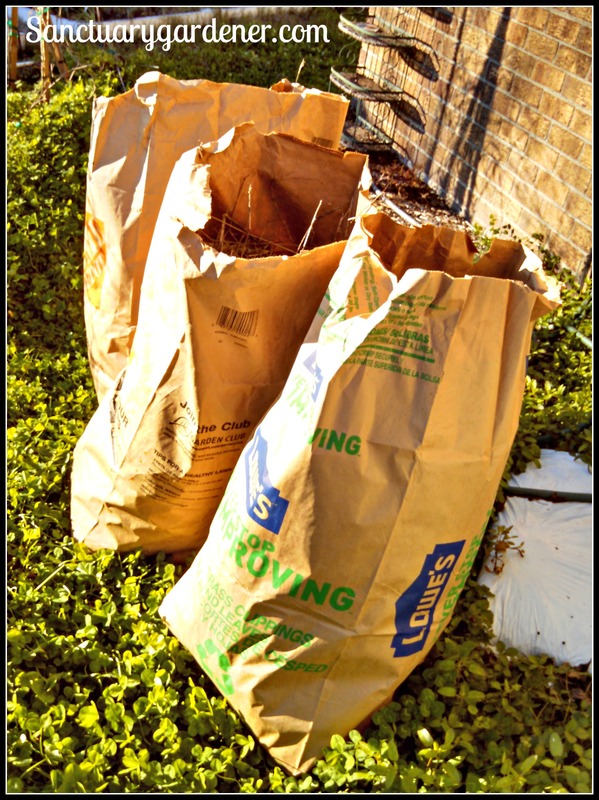 I am beginning to wonder if it is the bagged stuff we are putting into our gardens that is creating or exacerbating the problem? Granted, I am aware of the phosphorus history of our soils; it still seems peculiar to me that your raised beds reflect the same soil problem I am having with my in-ground traditional beds. If you could be so kind as to share with me the results and any recommendations you receive from your soil tests I would appreciate it. Thank you! I am so glad to have found a fellow gardener that is relatively near by and equally devoted to growing nutrient dense, fresh food is so gratifying to me. Thank you once again. Is there anything else you have done to your soils at all this past season? Yes, I’ve wondered how my beds could have too much phosphorous when I imported the soil. However, after thinking about it, I figured it out. My beds are 6 inches deep. Soil tests require that you get the soil that is 6 inches deep because that’s where the roots go. And at 6 inches, South Carolina dirt begins. Tomorrow’s post will have information on where I sent my soil sample and where I’m going to send the results for interpretation and recommendations for improvement. When I get my results AND my recommendations, I will share those in a post, as well. This year was an odd type of year because I had so much going on, it was so bloody hot, and my soil was so messed up, I didn’t put any amendments on the soil after the initial planting. I do use Espoma organic fertilizers and Azomite rock dust (for micronutrients – search my blog and you’ll find an article on it). With things so bad, I didn’t want to spend money not amending it correctly. 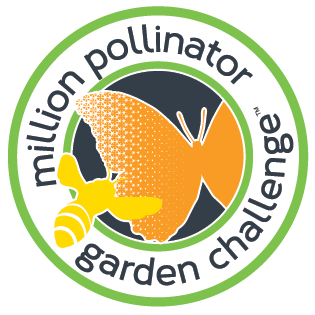 So, I decided not to plant a fall garden (GASP!) and wait for soil tests results – and just start over in the spring. Stay tuned….my saga continues. And please feel free to comment and question anytime!